More than 900 farmers and agricultural labourers have taken their lives during the past two years in Punjab. 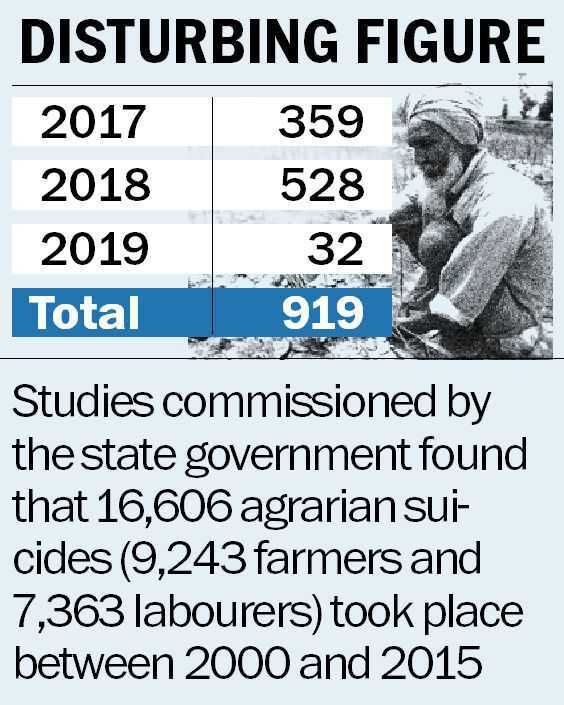 Compiled by Bharti Kisan Union (Ugrahan), the number is based on news clippings related to suicides appearing in five Punjabi newspapers (Punjabi Tribune, Jagbani, Ajit, Sach Kahoon and Spokesman) after the Congress government took over in 2017. The newspapers reported that 919 farmers and agricultural labourers committed suicide between April 1, 2017, and January 31, 2019. While 359 suicides were reported within the first nine months of formation of the government, the figure last year was 528. This year, in January alone, 32 suicides were reported. Sukhpal Manak, press secretary of Sunam block of the union, who prepared the list, says the actual number may be higher as they have not included the suicides reported in local news channels, Hindi and English newspapers and web portals. “There is no doubt that agrarian suicide is a continuous phenomenon despite the change in government,” says economist Prof Sucha Singh Gill. However, he feels a scientific study is needed to know the actual number. Significantly, the state government had taken various initiatives, including a debt waiver of Rs 3,600 crore, for crisis-ridden farmers of the state. The state aims to waive off a total of Rs 7,000 crore during its five-year term.